When this young couple got married, they planned it just right. A very subtle scheme colour of ice blue and white which made a massive statement. The winter theme detail went from a giant Christmas tree at the front of the ceremony all the way down to the beautiful bouquets featuring silver thistles to look like snowflakes, created by Bella Flora. To top it off the whole wedding was held at the beautiful Ringwood Hall Hotel in Chesterfield, Derbyshire; a stunning Georgian Manor House at the gateway to the Peak District National Park. The wedding was captured beautifully by M.P Media and also seen on Plans & Presents. 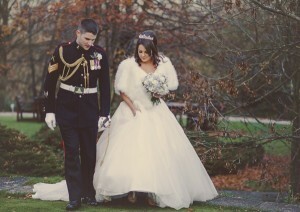 If you’ve recently got married we’d love to talk to you about our insurance solutions geared for the military family. Get a quote today for your new home, motor and military kit insurance for any serving persons.